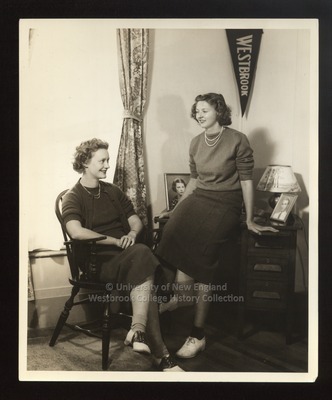 Two Westbrook Junior College girls, Barbara Smith and Anne Blanchard (Foote), pose in their dormitory room in this black & white photograph by Jackson-White of Portland, Maine. Barbara sits, in front of a window, in a Windsor chair with arms. Anne perches on the matching wooden desk. Over her shoulder, hanging on the wall, is a "Westbrook" banner. Photos and a lamp with lampshade adorn the desk. Both girls wear woolen A-line skirts and sweaters with the sleeves pushed up above their elbows. They each wear pearl necklaces, with two strands of pearls, dark bobby socks and saddle shoes. Their hair styles are feminine combed into both soft and hard curls pulled back at the sides.